After scoring a rare sovereign upgrade late last year, PM Modi wants to keep global investors and credit-rating companies on his side in the Budget 2018. Key to that will be sticking to his goal to narrow one of Asia's largest budget deficits. 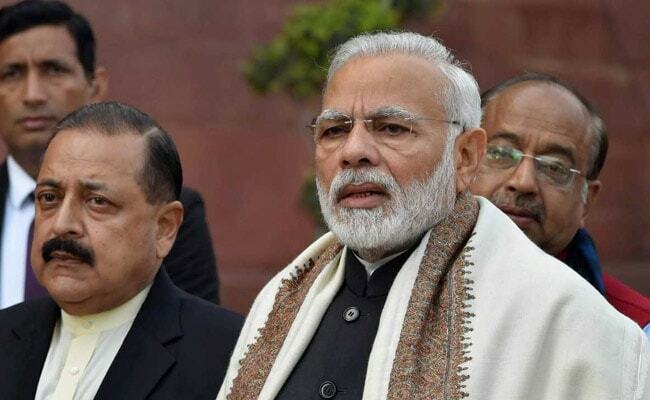 Prime Minister Narendra Modi has a tough balancing act in today's budget: maintaining fiscal prudence or handing out sops to placate rural voters ahead of next year's election. After scoring a rare sovereign upgrade late last year, PM Modi wants to keep global investors and credit-rating companies on his side. Key to that will be sticking to his goal to narrow one of Asia's largest budget deficits. Bond investors have already concluded that Finance Minister Arun Jaitley will deviate from those plans when he delivers his budget on Thursday, with yields climbing 96 basis points in the past six months, the most in Asia. In the last full budget before the elections, Mr Jaitley needs a growth boost for an economy that's slowing down to a four-year low, while appeasing angry young voters, who contributed to the ruling party's worst performance in PM Modi's home state in more than two decades in December. 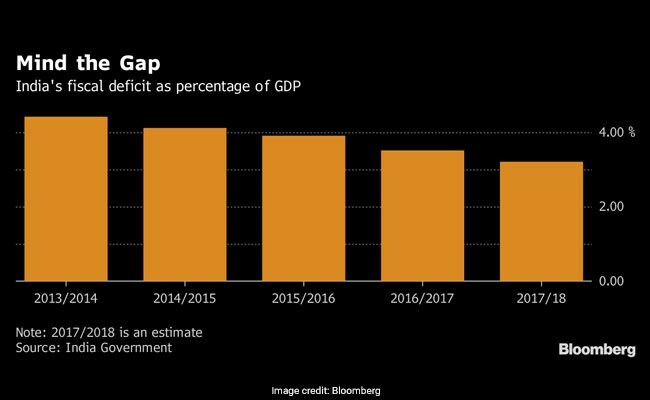 "The fiscal math is likely to get tougher, as ongoing rural distress and a lack of investment growth may need an immediate 'fiscal' helping hand," said Aayushi Chaudhary, an economist at HSBC Holdings Plc. in Mumbai. HSBC expects the government to miss its fiscal deficit target of 3.2 percent of gross domestic product for the year to March 2018, with the shortfall probably coming in at 3.4 percent amid slower growth, the chaotic implementation of the consumption tax that hit revenues, and a lower dividend from the central bank. ICRA Ltd., the local arm of Moody Investors Service, estimates that a 10 basis-point expansion in the fiscal deficit-to-GDP ratio allows for extra spending of Rs 18,500 crore ($2.9 billion). "Deviation from fiscal discipline may introduce further volatility into yields," ICRA analysts Anjan Ghosh and Aditi Nayar wrote in a note. "The recent rise in bond yields represents the real cost of fiscal slippage." There are already hints that the deficit targets may be missed. Mr Jaitley's chief economic adviser, Arvind Subramanian, said on Monday that a pause in the fiscal consolidation plan can't be ruled out and warned the government against setting overly ambitious targets. The government is set to overshoot its deficit target in the current year through March. The proposed budget for fiscal 2019 though, will look better -- for deficit reduction and investment plans. -- Abhishek Gupta of Bloomberg Economics. 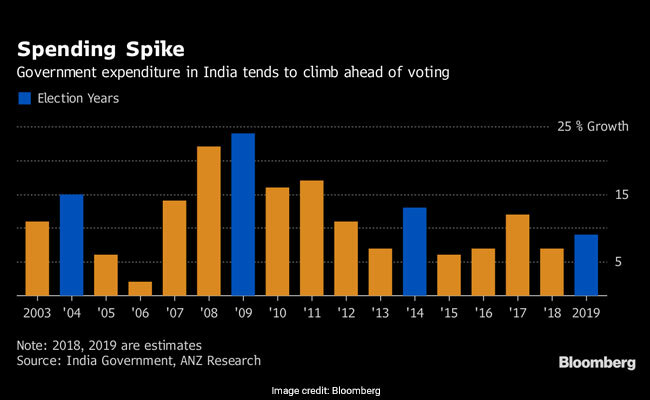 Any fiscal stimulus could prove to be a challenge for the Reserve Bank of India, which meets next week to decide on policy. While most economists surveyed by Bloomberg predict the RBI will keep the benchmark interest rate at 6 percent this year, rising price pressures may prompt policy makers to turn more hawkish. Teresa John, an economist at Nirmal Bang Equities Pvt., expects a renewed focus on agriculture and rural spending in the budget, with higher allocations to a guaranteed jobs program and increased spending for road development in villages and irrigation projects. "The recent state elections indicated the ruling Bharatiya Janata Party-led National Democratic Alliance government has not been able to gain much traction with rural voters," she said. "Farmers' distress on account of low prices of agricultural produce is likely to weigh on outcomes in the general elections." Increased welfare spending will mark a U-turn for PM Modi, who has criticized similar plans under the Congress Party-led government in the past. "Government spending on the rural sector spirals up ahead of any election as the voter base lies in the rural and urban poor areas," said Reshmi Khurana, head of South Asia investigations and disputes at Kroll, a risk consultancy.